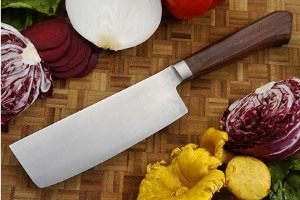 Cutting edge length: 5.90 in. Blade thickness (near bolster): 2.06 in. 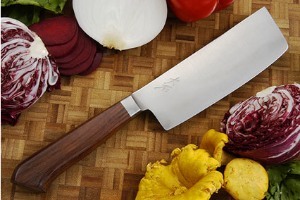 Description: The nakiri usuba is a traditional Japanese knife form ideal for chopping fruit and vegetables. 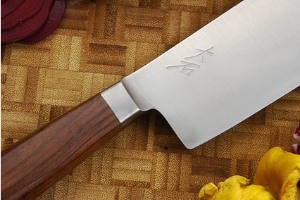 The edge is double-beveled, like a Western knife. Though sometimes called a vegetable cleaver, the thin edge geometry makes it a precision tool, rather than a Japanese equivalent to meat cleavers.